This is a RPG Maker MV plugin that will allow you to add various bright effects to your game's maps and battle system. These effects can make the game appear more vivid, light, and gives you control over the color settings of a particular map to make a more distinct feeling, too. The bright effects can be changed midway through events in both maps and battles, too. Be warned that this plugin was made in RPG Maker MV 1.6.1+ and is untested in lower versions so I cannot guarantee if it will work. To update to the latest version, please download the update here to at least 1.6.1+. Bloom: This puts a faint (or large) glow around lighter-colored objects on the map to give them a softer, hazy, brighter feeling. Map Defaults, Battle Defaults: Sets default settings for maps/battle unless a notetag or nametag is used to change it to something else. Scale: To adjust the strength of the bloom. Higher values is more intense brightness. Brightness: The brightness, lower value is more subtle brightness, higher value is blown-out. Threshold: Defines how bright a color needs to be to affect bloom. Godray: Puts down rays of light coming from the sky at an angle. Visible: If on, the godrays will be visible by default. If off, they won't. Speed: The speed at which the light flickers. Lower for slower rate. Higher for faster speeds. Gain: General intensity of the effect. Lacunarity: The density of the fractal noise. Angle: The angle/light-source direction of the rays. Color Adjust: Allows you to control the colors on the screen to be more/less bright, contrast more/less, and more/less saturated. Brightness: Adjusts the overall brightness of the screen. Use lower numbers to make it darker and higher numbers to increase the brightness. Contrast: Increases the separation between dark and bright. Darker colors become darker. Lighter colors become lighter. Increase this number to make the effect more intense or decrease it to lessen it. Saturate: Adjusts the intensity of color on the screen. 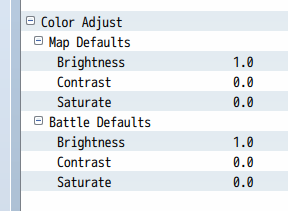 User higher numbers to make colors more intense and lower numbers to make it less. Use these notetags in maps or put them in the names of your troops. 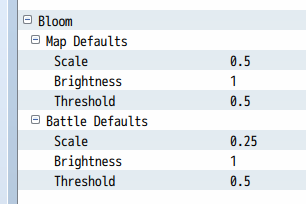 Changes the bloom scale to x for map/battle. x uses decimal values. Changes the bloom brightness to x for map/battle. x uses decimal values. Changes the bloom threshold to x for map/battle. x uses decimal values. Map only. Sets an adjusting scale when traveling left to right on the map (Horz) or up to down on the map (Vert). x and y use decimal values. Map only. Sets an adjusting brightness when traveling left to right on the map (Horz) or up to down on the map (Vert). x and y use decimal values. Map only. Sets an adjusting threshold when traveling left to right on the map (Horz) or up to down on the map (Vert). x and y use decimal values. 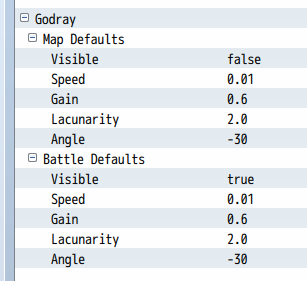 Changes if there will be a godray on the map/battle regardless of the default settings in the plugin parameters. Sets the flickering speed of the rays. x uses decimal values. Sets the gain/intensity of the rays. x uses decimal values. Sets the lacunarity/density of the rays. x uses decimal values. Sets the angle of the rays. x can be a negative or positive integar value. Map only. Adjusts godray speed going left to right on a map (Horz) or up to down on a map (Vert). x and y use decimal values. Map only. Adjusts godray gain going left to right on a map (Horz) or up to down on a map (Vert). x and y use decimal values. Map only. Adjusts godray lacunarity going left to right on a map (Horz) or up to down on a map (Vert). x and y use decimal values. Map only. Adjusts godray angle going left to right on a map (Horz) or up to down on a map (Vert). x and y use decimal values. Alters the screen brightness for the map/battle. x uses decimal values. Adjusts the screen contrast for the map/battle. x uses decimal values. Adjusts the screen saturation for the map/battle. x uses decimal values. Map only. Alters the screen brightness when moving left to right on a map (Horz) or up to down on a map (Vert). x and y use decimal values. Map only. Adjusts the screen contrast when moving left to right on a map (Horz) or up to down on a map (Vert). x and y use decimal values. Map only. Adjusts the screen saturation when moving left to right on a map (Horz) or up to down on a map (Vert). x and y use decimal values. after a map or battle has already loaded. - Replace x with a decimal value to change the Bloom Scale value. - Replace d with the duration in frames on how long to make this change. - This will cancel out any Map Horz/Vert notetags for Bloom Scale. - Replace x with a decimal value to change the Bloom Brightness value. - This will cancel out any Map Horz/Vert notetags for Bloom Brightness. - Replace x with a decimal value to change the Bloom Threshold value. - This will cancel out any Map Horz/Vert notetags for Bloom Threshold. - Restores the map/battle's default settings. - Replace x with a decimal value to change the Godray Speed value. - This will cancel out any Map Horz/Vert notetags for Godray Speed. - Replace x with a decimal value to change the Godray Gain value. - This will cancel out any Map Horz/Vert notetags for Godray Gain. - Replace x with a decimal value to change the Godray Lacunarity value. - This will cancel out any Map Horz/Vert notetags for Godray Lacunarity. - Replace x with a positive/negative value to change the Godray Angle value. - This will cancel out any Map Horz/Vert notetags for Godray Angle. - Replace x with a decimal value to change the screen brightness value. - This will cancel out any Map Horz/Vert notetags for screen brightness. - Replace x with a decimal value to change the screen contrast value. - This will cancel out any Map Horz/Vert notetags for screen contrast. - Replace x with a decimal value to change the screen saturate value. - This will cancel out any Map Horz/Vert notetags for screen saturate. This plugin is made for RPG Maker MV versions 1.6.1. I have not tested this plugin in lower versions so I cannot guarantee it works. To update to the latest version, please download the update here to at least 1.6.1.